Cook the noodles according to the instructions on the pack for stir-frying. 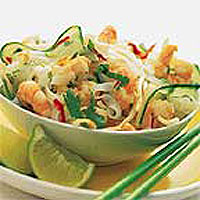 For the dressing, mix the lime juice, chilli, fish sauce and sugar in a small bowl. Heat a wok or large frying pan over a high heat. Pat dry the prawns with kitchen paper, then stir-fry until just turning pink. Reduce the heat slightly, pour the dressing over, add the beansprouts and cook for a further minute, or until the liquid has reduced slightly. Add the noodles and toss to coat in the dressing. Remove from the heat and mix in the remaining ingredients, reserving a little coriander. Serve garnished with the reserved coriander and lime wedges. Use a vegetable peeler to cut the cucumber into long, thin, even strips.